Creating and delivering successful vision care solutions to communities around the world rests on understanding and meeting local needs. It is only by taking a holistic and systemic view that we can help communities thrive, and meet our goal of reaching 50 million people by 2020. For us innovation is not just a buzz word. It embodies our culture of continuous learning entrepreneurial spirit. We want to do more to make the world realise that vision doesn’t just effect individual lives, but strongly impacts social and economic development. With 80% of visual problems being preventable and the potential global lost productivity reaching $272 billion a year, the time to act is now. The impact that comes from tackling uncorrected vision for a single individual is significant, but the ripple effect that occurs when you create jobs and businesses that are inclusive and appealing to women is where we believe long-term change can really happen. We look to create models that achieve this through two passionate and distinct teams – the BoP Innovation Lab and the 2.5 New Vision Generation (2.5 NVG). Together they develop, incubate, implement and scale models that reach consumers and communities who are underserved and often forgotten. And we are seeing real success. Our pioneering Eye Mitra program has helped over 800,000 people in their local communities to see clearly, and has created 2,500 businesses over the last four years. By providing on-going entrepreneurship training, tailored products, logistics and marketing support we can help these business grow, and are on track to meet our goal of training 10,000 Eye Mitra by 2020. Increasing the number of vision care providers does not stop here. In 2015, we launched the Vision Ambassador program providing one day training to learn the basic skills required to carry out near vision screenings and to sell over-the-counter reading glasses and sunglasses. Our initial experiences in China, Brazil and India have led us to take this model to Indonesia, Cambodia, Kenya and the Ivory Coast. By the end of 2016 2,000 vision ambassadors were at work, extending vision care into underserved communities. Rural communities are often not served by conventional distribution channels. By working with local partners such as hospital groups or non-profit organizations we are creating vital infrastructure that brings eye care to the doorsteps of people in remote locations. Mobile refraction vans were one of the first inclusive programs we pioneered in India. Today we are supporting our partners to operate a fleet of 40 specially equipped mobile vision clinics that fulfill the role of educating and raising awareness around vision, as well as equipping, people with prescription glasses on the spot. Brazil for example, lacks both ophthalmologists and vision care clinics. By partnering with CIES GLOBAL (Global Center for Education and Health Integration) we have developed a dedicated vision care bus that can screen up to 25,000 people per year and provide corrective solutions from Essilor’s 2.5 NVG product range to an estimated 8,000 people in and around Sao Paulo. Creating the right products that are suitable for the communities we work in ready at the point of screening, at the right price point– is vital for both consumers, but also for the development of sustainable and prosperous businesses. Since 2013, our 2.5 NVG teams have been developing a catalogue of affordable quality products that meet these needs. A key solution is Ready2Clip™ – frames and ready-to-mount lenses that enable a pair of glasses to be prepared to an individual’s prescription and delivered on the spot. The Ready2Clip range is part of an extensive portfolio of high-quality attractive eyeglasses for all wearer profiles – allowing consumers to choose an option that fits both their visual needs and their tastes. Our 2.5 NVG catalogue is being used extensively by our partners in the field as well as by more than 4,500 primary vision care workers we’ve helped to train. Feedback from our partners and wearers is essential if we are to continue to feed the innovation loop. Broadening and deepening our product range, as well as looking at ways we can simplify product ordering and supply chain management through cloud-based technologies, will ensure we continue to see growth and community development. 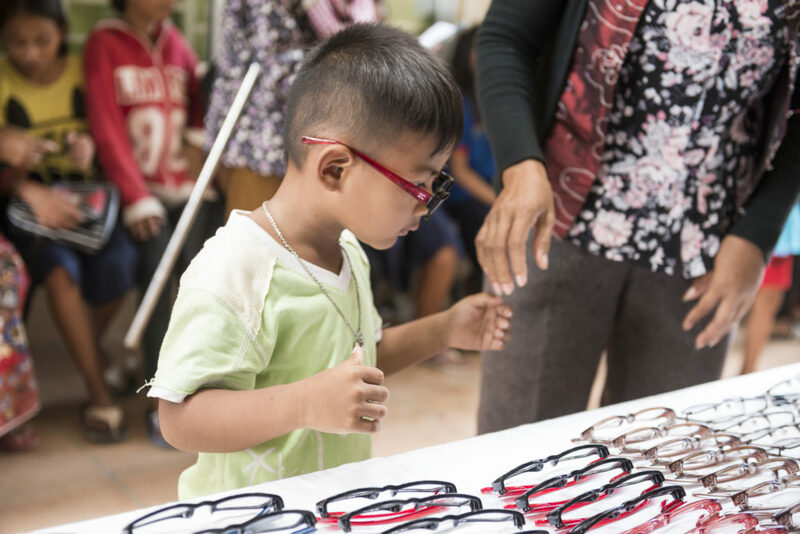 Our latest See Change report discusses these themes in more depth and demonstrates how we have ramped up our achievements in the last 4 years to ensure everyone knows t good vision is a basic human right.